The D10 conference kicked off yesterday with a gospel choir and a marching band. Tonight, we got a pro wrestling match. 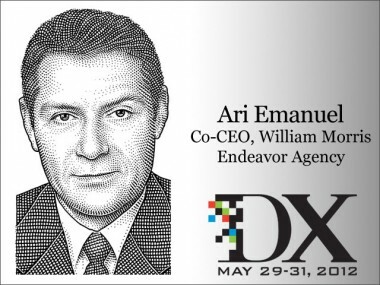 In one corner: Ari Emanuel, playing the role of “Hollywood guy who thinks Hollywood is in pretty great shape.” The opposing corner, I think, was filled with most of the tech-friendly D10 audience. In the meantime, here’s the takeaway: Emanuel is fine with technology when it generates additional revenue streams for him, like when Netflix and Hulu pay up for shows his clients have already produced for TV. But he doesn’t like Google’s technology, which he thinks enables piracy. And if you think you’re going to get HBO’s “Game of Thrones” without paying for HBO? You’re nuts. The William Morris Endeavor Agency head spends most of his time making big-dollar deals for his big-name clients, but he’s recently struck one of his own, via a pact that will give private equity firm Silver Lake a big chunk of his company. Good evening! Pretty great Miami-Boston game, btw: 96-94 Heat, w/1:36 left. Ah. Now we have sound here, so I can tell you what’s happening during the interview, too. Walt asks Emanuel to describe the North-South California wars: Hollywood versus Silicon Valley. Emanuel: We need Northern California to figure out how to keep our intellectual property from being stolen. If Google was in China, and their stuff was being stolen, they would leave China, right? You guys were just talking about intellectual property, today, right? I promise you that Larry David and Aaron Sorkin spend a lot of time on their stuff, and the guys up north need to figure out their dumb pipes, and help us protect that stuff. Now Emanuel is on a history lesson: In 1995, there were four networks, and distribution was the asset. In 2011, you can get TV everywhere. So the asset has moved from distribution to content creators. Netflix, Hulu, etc. Eventually, people are going to not just pay for “two cats on a couch, doing whatever they’re doing” — I think they’re going to pay a lot more for Aaron Sorkin or Seth MacFarlane. Kara: Why hasn’t this happened? Walt: Everyone in this room will pay for Aaron Sorkin, as long as they can buy it when and where they want, without paying my cable company for a bundle I don’t want. Emanuel: There are a lot of costs. From subs to advertising, that’s $100 million into Hollywood. If we go a la carte, that drops to $40 million. Walt: I pay for cable, including lots of stuff I want. But also Netflix, Hulu, etc. I’m not trying to steal anything. I’m happy to pay. But the real issue, isn’t if — it’s when — somebody’s going to figure it out. When SOPA died, a lot of conversations died. But they’ll start up again. Back to Ari! There have to be ways to filter illegal content, and I know the tech guys can handle that. Now, back to a discussion of “windows.” Emanuel thinks they will remain for big movies, but will shrink for indie/small-budget movies. The DVD business is gone, and with it the profit margin in the movie business. Maybe once physical goes away completely, the windows will, as well, where you go into the theater and get a credit for a digital movie. The music business has been good “from where we sit, because we’re in the concert business,” and because musicians can go direct. Books, too. Walt: Let me focus on TV. How can this pay-TV bundle business last and last? Now a brief interlude about Ari’s tolerance for pain and willingness to fight strangers. Back to Kara: What do you think about watching content in bite-size clips? And what about Hulu and Netflix paying for original content? 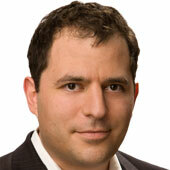 Emanuel: We don’t think about the devices when our clients make stuff. We think about the economics. I think the artists might get upset about it, but for us it’s mainly an economic discussion. Walt: Do you watch TV on an iPad? Kara: Making shows for digital is a small part of your business, right? Clients are doing this all the time. We have a whole group that does this. When we see something that is big on the Web, we try to figure out how to make it mainstream. If you get a show that goes into syndication, it’s tens of millions of dollars, and there’s lots of syndication. Is that business going away? Maybe? Walt: But everyone I know who’s not in Hollywood hates their cable company. Walt: But cord-never is happening. Emanuel is explaining the difference between scripted and unscripted TV to Walt and Kara. Walt: I didn’t watch “Friday Night Lights” when it came out. But my wife and I watched all of it on Apple TV. Emanuel: Right. So we had a movie and a TV show. Would you watch if we had another movie, where they go to Philadelphia? Emanuel: Well, I’ve been talking about this at Sheryl’s [Sandberg] house. There are different ways to finance this movie. Maybe we could finance it via Facebook fans. There are lots of ways to finance a movie like this, with a fan base like this. The budget for this should be about $15 million. Kara: So you could charge one million Facebook fans $20. Emanuel: That would be $20 million. Or I could go international. Walt: So you are trying to get ahead of trends. Emanuel: Well, no. I’m still going to do traditional distribution. And this movie will take $25 million to market, etc. Now a discussion of Walt’s favorite TV shows. He’s just gotten into “Game of Thrones;” watched the first season on iPad, via iTunes. Now on HBO Go. Walt: I don’t think people care about networks anymore. Emanuel: Les Moonves and CBS are doing great. Kara: Talk about the Silver Lake deal, please. Emanuel: We’ve been increasingly interested in tech. We’ve been buying and investing in start-ups. We did Otoy, which you guys showed off today. We’re working with Sean Parker on Airtime. When we merged a couple years ago, we “kind of shifted the whole focus” in terms of where things were going, and we’ve spent a lot of time up in Silicon Valley, trying to figure it out. We also started a merchant bank that does a lot of advising in digital. So when Silver Lake saw what we were doing, they got interested. Kara: You were talking to Zynga about taking some of their titles and making an investment, expanding them. Kara: Have you talked to them about it? Kara: What about a mashup of Twitter and “Hoarders”? Emanuel: Don’t get into the reality-TV business. You’re not very good about it. Walt: We tried to get Tim Cook to talk about Apple TV last night. Emanuel: I can’t wait for it. Kara: Do you know anything about it? Now back to the Uber TV show, which Kara wants to appear on. Walt: Anyway, lots of people are multitasking when they watch TV, playing Angry Birds, tweeting, etc. Kara: Who are the important tech companies for you? Emanuel: Google, Verizon, AT&T, Twitter, Microsoft, depending on the Nook. Amazon and, of course, Apple. The usual. But where Google decides to play on piracy is very, very important for us. And I think they’re kind of going slowly. Walt: You don’t have a problem with Apple and Microsoft when it comes to privacy? Emanuel: I don’t like the music industry’s deals with Apple, but they made a deal. But Google needs to figure out what they do with piracy. That’s the most important thing. Q: Let’s say you’re in charge of Google. What would you change? Q: I don’t buy that. Emanuel: I don’t know how he’s supposed to do this job. (And now Emanuel is sort of threatening the questioner, in a ha-ha kinda jokey way.) But I want them to stop helping people steal my client’s content. Q: So you want them to censor search results? Emanuel: I don’t want them to censor results, but they have a bunch of smart guys there that can figure this stuff out. Q: Back to Verizon/AT&T/Google. Aren’t you saying that the road is responsible for the fact that someone drove on it before they robbed my house? Q: You rep Buzz Bissinger, who has had a dustup with Amazon over pricing on his e-books. How’s that going to work out? Q: I want to buy “Game of Thrones” for $5 an episode without paying for HBO. GIVE ME GAME OF THRONES NOW!!!!!!!! Ari Emanuel is way better when he’s doing his pro wrestling shtick. Now he’s in refractory mode. Less fun. Historical discussion about Apple, iTunes, and the music business. Emanuel, like many content people, points out that iTunes singles were great for Apple, not great for the music business. He thinks labels would have been better off striking a deal with the original Napster. Q: So why doesn’t the TV business make the same deal now? Because the same thing will happen with TV. Emanuel: What’s the deal to make? These things cost lots of money. You give me the economics that can make this happen, that can make me help you get “Game of Thrones” at a price you would pay, a la carte. Q: But you can’t control the market price. It’s going down. Emanuel: No, the TV business is stronger than ever. Q: It’s going to go away in 20 years. Emanuel: I’ll be 70+. That’s fine. Q: There are lots of distributors in Silicon Valley. Facebook, Google, etc. Shouldn’t you be there? Q: I work for comScore. What do you want from people who measure media, like Nielsen and me? Kara: What’s a misconception about you? Emanuel: I’m not rude and mean! I’m a nice guy! And we’re done. Closing music: “Sabotage” by the Beastie Boys.